HC3 is the IT virtualization infrastructure platform that is changing the way IT runs from the ground up. Combining servers, storage, hypervisor, and backup/DR, HC3 is helping IT administrators transform their infrastructures to be more scalable, more highly available, and more affordable. Simplicity is the not-so-secret ingredient in HC3 delivering savings over traditional infrastructure solutions and the hyperconverged competition. Scale Computing provides a complete, virtualization, solution for the datacenter, in a single appliance designed for rapid deployment, ease-of-use, seamless scaling, high performance, and cost effectiveness. HC3 brings together virtualization, servers, storage, and backup/disaster recovery into a single solution. All of the components are built together into the solution, including the hypervisor, with-out the need for any third party components or licensing. Every component has been designed for highly efficient virtualization infrastructure, from the intelligent storage architecture to the low cost of ownership. The key to the success of the HC3 and to the success of HC3 customers is the ease-of-use. HC3 eliminates wasteful management tasks that have kept IT administrators trapped in datacenters like overpaid babysitters rather than allowing them time to focus on improving business processes. The simplicity of HC3 directly impacts IT with higher productivity and lower costs. One of the most challenging tasks for IT can be adding capacity to existing infrastructure. With HC3, the simplicity of design and ease of use allow for seamless scaling of infrastructure. New appliances can be added into a running cluster seamlessly, within minutes, without disruption to any running workloads. Different models and capacities can be used together in nearly any combination to scale out resources as needed. Based on simplicity of design, HC3 is inherently more stable and more highly available than traditional virtualization solutions. Redundancy, high availability, and resiliency are built into HC3 in every way, including the option of disaster recovery as a service. With HC3, both planned and unplanned downtime can be virtually eliminated, creating more confidence with customers both internal and external. The HC3 virtualization platform brings together servers, storage, virtualization, and disaster recovery into a single, feature rich solution. This guide describes all of the features that make HC3 the perfect infrastructure solution for any datacenter. The entire HC3 solution including hardware and software is managed from a single web interface that can be accessed from any node in a cluster. 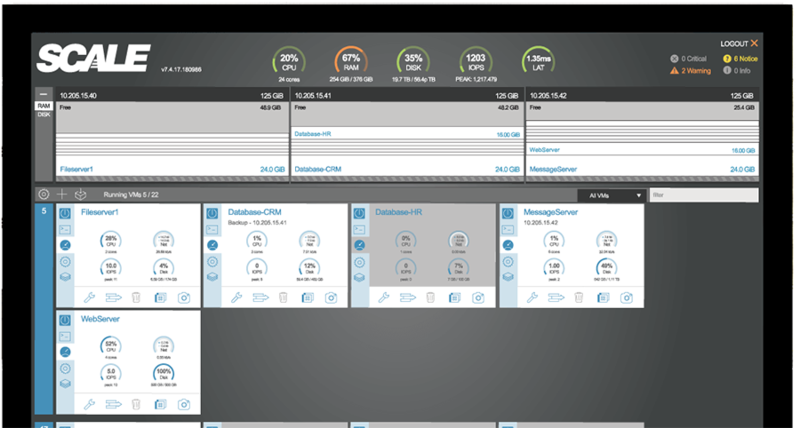 The simple interface design allows both storage and compute resource management and virtual machine management from a single pane of glass. Resource statistics are displayed in real-time along with IOPS, both per VM and cluster wide. VM consoles are also immediately available from the web interface. HyperCore Enhanced Automated Tiering is the part of SCRIBE that manages data efficiently between the flash SSD tier and the spinning HDD tier in the cluster storage pool. It prioritizes blocks of data on SSD or HDD based on a I/O heat map that tracks I/O against each virtual disk. Although HEAT is primarily automation happening behind the scenes, it provides the ability for the user to tune the relative priority of every virtual disk in the cluster to further optimize the SSD usage where it is needed the most. You can literally turn it to 11. HC3 receives software/firmware updates directly to the HC3 Web Interface where they can be applied automatically with no downtime. 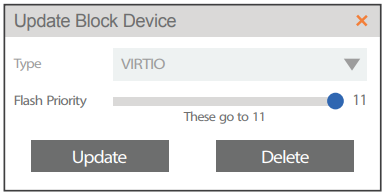 A single click updates the hypervisor, the storage system, the firmware, and any other part of the complete HC3 system. The automated update process will automatically relocate VMs between nodes to free up the nodes, one at a time, to be updated. When all of the cluster nodes are updated, the VMs are returned to their original configuration across the cluster. If a node fails within the cluster, all VMs running on that node are automatically failed over to one of the remaining cluster nodes. Failover happens within minutes for minimal disruption. After the node has been restored or replaced, the VMs can non-disruptively be live migrated back if desired. VMs can be replicated between two HC3 clusters with native, built-in replication. Replication can be local or remote across any distance and can be configured to replicate changes as often as every 5 minutes. Granular selection of VMs for replication allows a range of between one and all of the VMs on a cluster to be replicated. Replica VMs on the target cluster can be booted up within minutes in the event of a failure of the VM on the primary cluster. VM snapshots can be scheduled intuitively and flexibly from the HC3 Web Interface. Schedules can include multiple rules spanning schedule intervals based on minutes to months. Schedules are created as templates that can be assigned to one or more VMs across a cluster. HC3 uses a unique thin cloning technique that allows cloned VMs to share the same data blocks as their parent VM for storage optimization, but with no dependencies. If the parent is deleted, the clone is not affected and continues operating without disruption. When a cluster needs more resources, a new node can be added within minutes without any downtime to the existing nodes or VMs. After racking, cabling, powering up, and assigning an IP address, the new node and its resources are seamlessly absorbed into the cluster, including the storage capacity being immediately added to the storage pool. Adding nodes results in an immediate performance increase to the running VMs as the resource pool is expanded. With HC3, any two cluster nodes across all HC3 families (1000, 2000, and 4000) can coexist in the same cluster and contribute to the cluster storage pool. This allows clusters to grow not just linearly but in whatever way is needed or desired. This support for different size cluster nodes can facilitate non-disruptive upgrades to the infrastructure by adding newer, bigger nodes and then retiring or repurposing older small nodes if desired, all while keeping the VMs running. HC3 offers a remote access point exclusive to ScaleCare support to help diagnose support issues and take corrective actions if necessary. This remote access dramatically speeds up support issue resolution by giving ScaleCare support engineers the ability to see issues firsthand and in real time. HC3 virtualization infrastructure can be used in a variety of ways but here are some of the most common use cases for our HC3 customers. With HC3, the solution includes the hypervisor with no additional costs or licensing fees. After paying VMware licensing fees for years, many of our customers saw the value in becoming free of these extra fees to lower their IT costs and reinvest in better technologies. Many HC3 customers saw the value of built-in backup and high availability after their legacy solutions had proven ineffective despite being an added cost. The out-of-the-box features of HC3 gives organizations higher levels of availability on a more stable and easier to use platform. In general, our customers have all been looking to lower their total cost of ownership (TCO) for IT infrastructure. We have designed HC3 to reduce IT infrastructure costs in almost every way. Many of the hidden costs of IT infrastructure such as unplanned downtime, management, maintenance, training, and consulting are virtually eliminated with HC3. Other solutions that integrate multiple vendor solutions only add complexity which increases costs. We believe HC3 is a better way, and our customers agree. HC3 customers who were managing remote offices and branch offices saw the value in HC3 for both ease of use and low entry cost. The ease of use and remote web-based management capabilities meant that their remote sites could be managed more efficiently and with less cost. The low cost, ease-of-use, and scalability of HC3 make it perfect for VDI infrastructure. Scale Computing has validated our solution with VDI vendors to allow our customers to implement VDI from the SMB to the enterprise. When it comes to data access for users, faster is better for productivity. Many factors affect how efficiently the data is delivered to users including networking, processing, and maybe the most important, storage architecture efficiency. Many storage architectures are complex, layering multiple storage protocols along with virtual appliances simply to present block storage to virtual machines. Scale Computing has created a storage architecture within HC3 to deliver high efficiency along with streamlined simplicity. The Scale Computing Reliable Independent Block Engine is the core component of the HC3 system, combining the storage drives from each HC3 node into a single, logical, system-wide storage pool. The pooling occurs automatically with no user configuration required. Blocks are stored redundantly across the system to allow for the loss of individual drives or an entire system node. The SCRIBE storage pool is available to all nodes of the system and presented without any file systems, protocols, or virtual appliances. SCRIBE is embedded directly in the HC3 HyperCore operating system. When a VM is created on HC3, the virtual disks provide direct block access between the virtual machines and the SCRIBE storage pool. The only file systems created in HC3 are the file systems used by the guest operating systems in the VMs to address the virtual disks. Other storage architectures tend to emulate SAN or NAS devices that were traditionally used in virtualization. These start with a storage pool on the lowest level with a file system layered on, then presented to the hypervisor where another file system is layer on and managed by a virtual storage appliance (VSA), and finally presented to a VM where another file system is layer on. Aside from the multiple levels of protocols that must be traversed for each I/O operation, the VSAs managing the storage can consume a large portion of the RAM and CPU that would otherwise be used for creating more VMs. The example above includes an SSD cache as part of the VSA architecture. SCRIBE can also incorporate SSD but instead of using it merely as a cache, it is used as a storage tier within the SCRIBE storage pool. As a cache, the higher speed of SSD helps mask the inefficient design in VSA architecture. In HC3, as a storage tier, SSD is used for data storage, increasing both the size and the overall speed of the storage pool access. With SCRIBE, a hybrid storage architecture allows for data to be moved dynamically between SSD and HDD tiers using HyperCore Enhanced Automated Tiering (HEAT) technology. Data sets are most commonly characterized by only a small percentage of data being actively accessed. In a hybrid, tiered storage system, the most benefit to efficiency comes from the active data residing on SSD and the inactive data being stored on slower HDD storage. The HEAT technology in SCRIBE monitors data access and creates a dynamic mapping of active data blocks and moves these blocks to the SSD storage tier while moving inactive storage blocks off of SSD onto HDD. This movement of data blocks between tiers is transparent to users and even administrators, happening automatically. By default, each disk is actively trying to achieve an equal level of efficiency by moving data blocks between SSD and HDD tiers. Sometimes, one disk requires an even greater level of efficiency than another disk; in these cases HC3 administrators can give those virtual disks priority. For each virtual disk, the relative priority of SSD utilization can be adjusted on a scale from 0-11. The default for all disks is 4 and if no disk is ever changed, no disk has priority over any other. Any disk can be dynamically adjusted in priority, up or down, to increase or decrease the SSD utilization on that disk. Priority 0 will completely bypass SSD and only utilize HDD for that disk. Priority 11 will attempt to put the data for that disk completely on SDD, or at least as possible given the available SSD on the system, taking into account all other disk priorities. HC3 has built-in, real-time IOPS meters for each virtual disk so the results of changing the priority on a particular disk can begin to be seen immediately. Because the virtual disks can be changed dynamically, the priority can be adjusted as much as necessary to achieve the correct balance of IOPS efficiency across virtual disks and VMs. SCRIBE and HEAT are both designed to automatically incorporate new storage from additional HC3 nodes in a system. When an HC3 system is scaled out with new nodes, the storage from the new nodes is seamlessly added to the SCRIBE pool and immediately visible and usable from every node in the system. There is no storage configuration required by the administrator, only the option to adjust SSD priority as needed. By design, embedding the storage system in the hypervisor allows HC3 to have extreme efficiency with absolute simplicity. With HC3, users experience the benefits of SSD as a tier, and have the edge of clustered redundancy that absorbs the loss of failed disks or entire nodes. This is the advantage of HC3. A storage system that is designed specifically to work with modern virtualization. None of the complexity of SAN and NAS that was designed to work with physical servers. Efficiency, convergence, and user experience have been simplified in one system. The uniqueness of the Scale Computing solution is its patented HyperCore Software. HyperCore is preloaded onto all HC3 nodes, ready deploy straight out-of-the-box, fine-tuned for each HC3 node type with nothing additional to license or install. HyperCore continuously monitors all virtual machines, software and hardware components to detect and automatically respond to common infrastructure events, maintain application availability and simplify datacenter management. 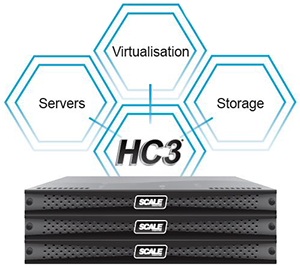 Scale Computing HC3 and the HyperCore architecture were designed to provide highly available, scalable compute and storage services while maintaining operational simplicity through highly intelligent software automation and architecture simplification. HyperCore puts intelligence and automation in the software layer and was designed to take advantage of low cost, easily replaceable and upgradable “commodity” hardware components including the virtualization capabilities built into modern CPU architectures. By clustering these components together into a single unified and redundant system, these attributes combine to create a flexible and complete “datacenter in a box” that operates as a redundant and elastic “private cloud” with additional nodes being automatically “incorporated” into the cluster and failed hardware being expected, and easily replaced with minimal effort or disruption. Other operating systems that run on virtualized x86 and x64 platforms may work, but they will not be fully supported by Scale Computing. Customer can add up to 8 nodes per cluster with no disruption to operation. Contact Scale for information on designing clusters larger than 8 nodes. The HC1000 Series, are the entry level HC3 systems designed for small to mid-sized company virtualization environments. HC3 from Scale Computing is an advanced and highly flexible IT infrastructure solution designed for simplicity, scalability, and high availability. All businesses need disaster recovery (DR) and some businesses have more than one production site to consider. 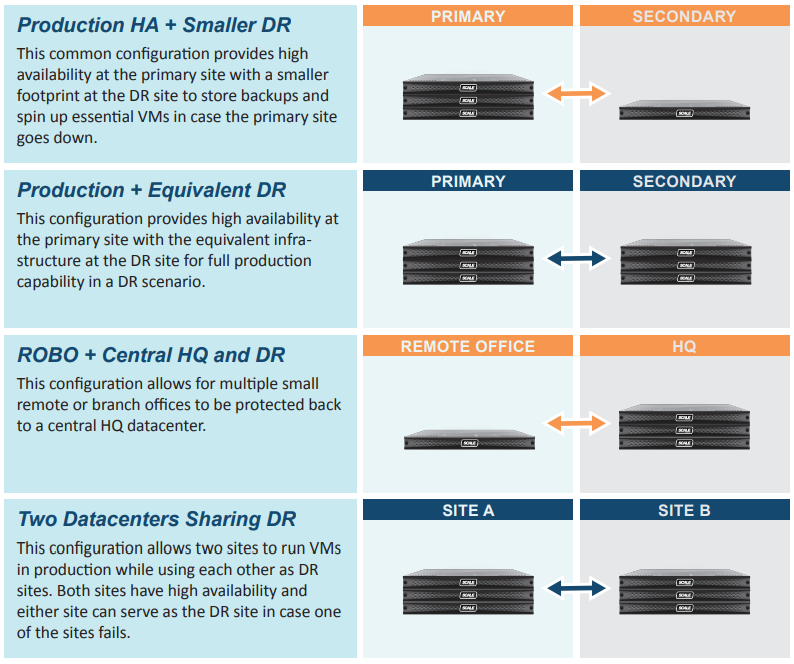 HC3 can be deployed in a number of configurations for production and DR but these are the more common configurations. With HC3, nodes can be mixed and matched with different models and sizes of nodes. It is easy to create clusters or configure single nodes to meet your capacity needs. You can also add nodes as needed to scale out your clusters, adding whatever resources you need. Flexibility and simplicity come at no extra cost. What is HC3 and why do I need it? HC3 is an appliance-based hyperconverged infrastructure solution. HC3 combines servers, storage, virtualization, and backup/disaster recovery into a single appliance. This hyperconvergence of technologies radically simplifies IT infrastructure making it easier to implement and manage and significantly reduces the total cost of ownership of infrastructure. The HC3 hyperconverged appliance approach allows seamless, non-disruptive infrastructure scale out and automated, non-disruptive software and firmware updates. Our customers choose HC3 to reduce complexity and cost from IT infrastructure so they can focus their IT administration on improving applications and process rather than managing and maintaining complex infrastructure. For better or worse, we get this question a lot. Scale Computing launched HC3 in 2012 and we’ve steadily been growing our customer base and business. We are well-funded and well known with many awards under our belt. We are headquartered in Indianapolis, IN with our primary development office located in San Francisco, CA. Our goal has been to alleviate complexity and cost from IT shops where we’ve felt the cost of VMware has been too high. We’ve gained a very loyal following in the SMB market where complexity and cost are more acute problems, but also in the distributed enterprise market where simplicity and affordability are a huge benefit to our customers. This may be our most frequently asked question! The answer is No. HC3 was designed as an alternative to VMware. HC3 uses our own HyperCore operating system and KVM-based hypervisor which does not require any additional licensing costs. Including our own hypervisor rather than supporting VMware allows us to deliver a simpler, more efficient, and most importantly, more cost-effective solution than VMware. Many of our customers choose HC3 to specifically move away from using VMware. So no, there is no VMware on HC3, but we believe you’ll be better off without it, just ask our customers. How does HC3 stack up against other hyperconverged solutions? Compared to other HCI solutions, HC3 is by far the easiest to manage. Taking into account the ease of implementation, the unified web-based management, the automatic storage pooling, the non-disruptive updates, and the seamless scale-out, HC3 has the most efficient architectural design for ease of use and management. Unlike other solutions that use virtual SAN storage architectures, HC3 uses hypervisor embedded storage which is not only easy to use, but eliminates the extra layers of storage protocols and file systems that exist in other architectures. All of that ease of use and efficiency in HC3 adds up to a lower cost of ownership. This makes HC3 the popular choice for organizations that want to reduce IT costs. How many HC3 appliances do I need? There are a number of different HC3 models featuring different configuration options and resource capacities. Our users generally use a cluster of 3 or more appliances for VM high availability for primary production. Some users deploy single appliances for DR sites or for remote offices or branch offices.The number of HC3 appliances you need will be determined by the size and configuration of the appliance models you choose and how you need to support backup/DR and remote/branch offices. How much rack space do I need for my HC3 appliances. HC3 appliances vary in size between 1U and 2U sizes. Even with a battery backup and network switches, your HC3 systems should only fill a fraction of your existing server rack space. Scale Computing sales engineers have experience and expertise in recommending cluster and appliance sizes for any environment. How can I convert my existing workloads to run on HC3? There are several options for converting existing workloads to run on HC3. For Windows and Linux VMs, Scale has partnered with Carbonite and their Double-Take product to offer HC3 Move which can be used to migrate physical (P2V) and virtual (V2V) workloads onto HC3. It requires near zero downtime and gives the user ultimate control of deciding when to cut over from their source machine onto the HC3 platform. Can I scale storage separately from other resources? HC3 is an appliance-based solution that scales out by adding new appliances to existing HC3 clusters. Each appliance must have both CPU and RAM to operate so there is no purely storage appliance, but customers have a lot of options in configuring HC3 systems for build-to-order. A customer can configure a new appliance for maximum storage capacity and minimum CPU and RAM. This will add significantly more storage to the cluster while still providing necessary CPU and RAM to make that appliance a functioning member of the cluster. Do I need or can I use a separate storage appliance (SAN/NAS) with HC3? You don’t need to use external storage appliances with HC3, but you can use them. HC3 has storage built into each appliance so it is unlikely to require any external storage appliances. How much storage is based on the appliance models, the number of appliances and how they are configured and our newer HC5150D appliance models can be configured with up to 77TB of raw storage each. Users who have existing storage appliances that they want to continue using with HC3 have done so either as storage for individual VMs or as storage for backup/DR. How do I backup my VMs on HC3? There are several options available to HC3 users, including the native HC3 backup capabilities. HC3 features a full set of native features to allow users to backup, replicate, failover, restore, and recover virtual machines. Snapshot-based, incremental backups can be performed between HC3 systems without any additional software or licensing. Many HC3 users implement a second HC3 cluster or a single node to serve as a backup location or failover site. The backup location can be as second HC3 system that is onsite or remote. The backup location can be used just to store backups, or to fail them over if the primary HC3 system fails. HC3 VM backups can be restored to the primary HC3 system sending only the data that is different. Backup scheduling and retention can be configured granularly for each VM to meet SLAs. Can I run virtual desktops (VDI) on HC3? Yes. Desktops run as just another VM on HC3. HC3 is not a native VDI solution, meaning there is no VDI specific software or architecture built into HC3, but HC3 can serve as the virtual infrastructure for a number of VDI solutions. HC3 has partnered with other solutions like NComputing and Workspot VDI 2.0, for example, to deliver simple and scalable VDI solutions to customers. Many customers use Windows Remote Desktop Session Host (aka Terminal Services) to provide users access to a managed, server based desktop running on HC3 to a variety of devices and clients. Alternately, other desktop management tools such as System Center Configuration Manager, XenApp, and others can be used on HC3 to provide desktop management tools and streaming capabilities to provide some of the same benefits associated with VDI. What are the networking requirements for HC3? HC3 appliances require either 10Gbe or 1Gbe networking, depending on the configuration and storage. When clustered, HC3 appliances use ethernet for storage across cluster nodes. This storage networking is handled on a private network layer and 10Gbe switching is recommended when flash storage is included. 1Gbe switching may be used with all spinning disk (SATA, SAS, NL-SAS) clusters. Single node appliance configurations may also use 1Gbe switching, even if they include flash storage, as there is no need for storage networking with a single appliance. What happens to my VMs if a drive or a cluster node fails? An HC3 cluster consisting of 3 or more nodes is both resilient and highly available. A drive failure on a cluster will not cause any disruption and VMs will continue to run normally, even when the drive is replaced. If an entire HC3 cluster node (appliance) fails, VMs that were running on that appliance will be restarted automatically on other cluster nodes. When planning an HC3 cluster, it is important to anticipate the required resource capacity to allow VMs to fail over from a failed node as a precaution. On a single node appliance configuration, like on a cluster, a drive failure on a single node configuration does not affect running VMs. If the entire appliance fails in a single node configuration, there are no other nodes to failover VMs to, unless you have enabled replication to a second node or cluster. With replication, VMs can be failed over to another HC3 system. Does HC3 require a management solution like vCenter or System Center? Not at all. HC3 has web-based management built into each appliance. You can begin managing your HC3 system without any additional software or servers. Just connect to any one of your appliances and you’ll be able to use to HC3 Web Interface to manage that system as well as remote HC3 clusters and single appliances. Why is it important to renew HC3 Maintenance and Support Agreements? HC3 Maintenance and Support includes three vital elements: 24/7 phone and email support, HyperCore software updates, and hardware replacement (depending on the age of the hardware). Our expert ScaleCare Support Engineers are on-call 24/7 with help for any support issue. We believe support is as important as the solutions we provide. We know the whole system inside and out because we designed it, and that helps our engineers troubleshoot and resolve issues quickly. Scale Computing provides vital updates to the HyperCore operating system and hypervisor for both security enhancements and new features and functionality. All updates and new software features and functionality in HC3 are available at no extra cost to HC3 systems under active Maintenance and Support Agreements. Customers under active Maintenance and Support Agreements have access to hardware replacements that are shipped next business day. Our customers who value their investment in HC3 and want to keep scaling it out for the future get the full value from the Maintenance and Support Agreement. What level of support is included with HC3? HC3 appliances come with the first year of support and maintenance included. With HC3 there is only one level of support for each and every customer: ScaleCare Support. Our premium ScaleCare support includes 24/7 phone and email support provided from our expert support engineers out of our headquarters in Indianapolis. Support and maintenance also includes all software and firmware updates and hardware replacement. Additional years of support and maintenance can be added to the initial purchase or support and maintenance can be renewed at a later date. Providing the best support is a key part of the HC3 solution.